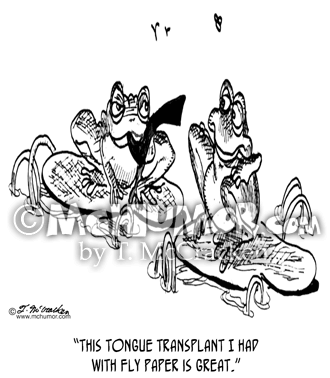 Frog Cartoon 3122: A frog says to a princess, "Sorry, my lady, but one metamorphosis is all I can handle." 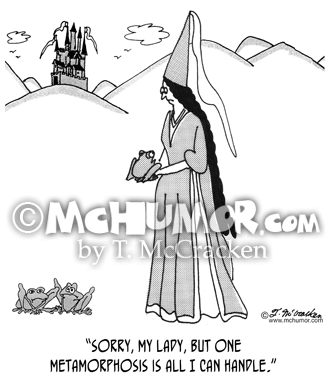 Environment Cartoon 6897: A game warden saying to a princess, "I'm sorry. 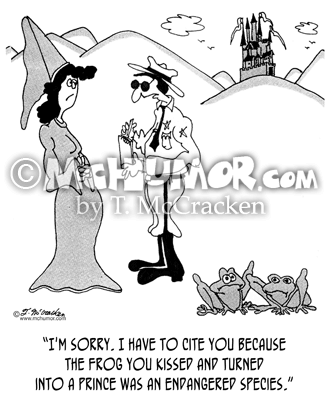 I have to cite you because the frog you kissed and turned into a prince was an endangered species." 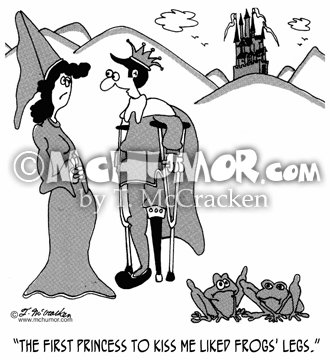 Relationship Cartoon 5168: A prince with peg leg saying to a princess, "The first princess to kiss me liked frogs' legs." 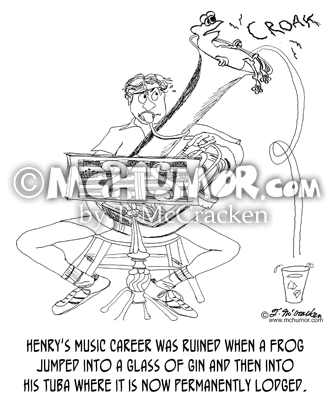 Frog Cartoon 1238: "Henry's music career was ruined when a frog jumped into a glass of gin, and then jumped into his tuba where it is now permanently lodged." 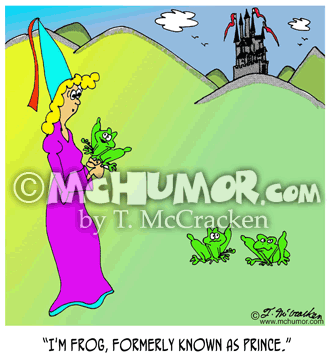 Music Cartoon 7475: A frog saying to a princess, "I'm Frog, formerly known as Prince." 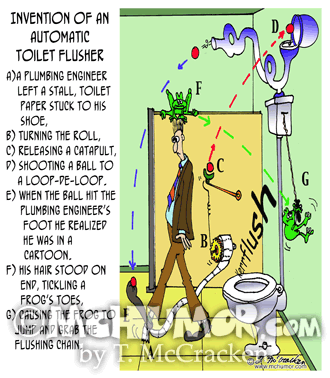 Plumbing Cartoon 7437: Invention of an Automatic Toilet Flusher A) A plumbing Engineer left a stall, toilet paper stuck to his shoe B) turning the roll, C) releasing a catapult, D) shooting a ball to a loop-de-loop. 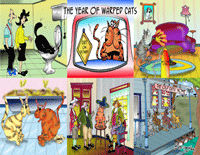 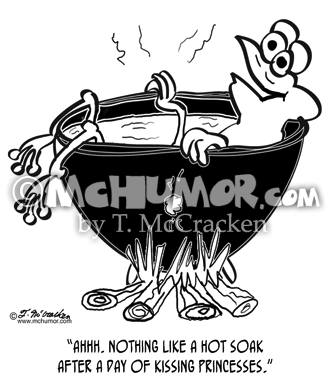 E) When the ball hit the plumbing engineer's foot he realized he was in a Rube Goldberg Cartoon. 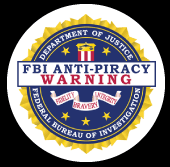 F) His hair stood on end, tickling a frog's toes, G) causing the frog to jump and grab the flushing chain. 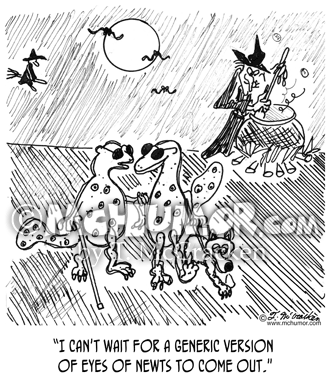 Pharmaceutical Cartoon 1406: A blind lizard with a seeing eye dog says to another, "I can't wait for a generic version of eyes of newts to come out."